Iolite is the gem-quality blue or blue-violet variety of cordierite. 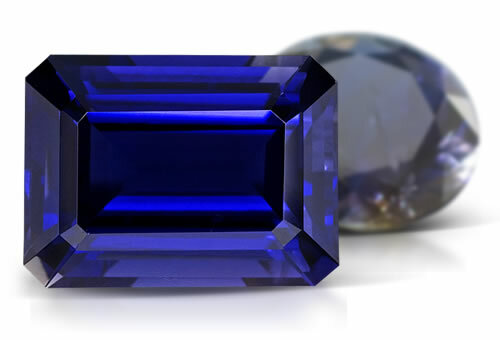 While iolite enjoyed popularity in jewelry in 18th-century Europe, this naturally beautiful gemstone is relatively new to today's jewelry market, and is regaining popularity with the public. Because of its varying levels of hardness and strong pleochroism, iolite is one of the most difficult stones for lapidaries to fashion. It must be cut in certain directions to take advantage of the best color, which can be tough when the shape of the rough doesn't lend itself to cutting in that same direction. visible pleochroism, refractive index, birefringence and optic character. Eye visible pleochroism. Iolite is a type II clarity stone. Sometimes apatite, hematite, iron oxide, magnetite, mica and rutile, inclusions are seen. Bloodshot iolite is the adventuresent variety with red plate like hematite, iron oxide inclusions along with goethite.